Solid orange liquid, full inch of dusty white head, dense, tight lace. Aroma was that Nelson funk you up. Easy drinking, plenty hop flavors, pungent, hides the booze, malt just right, this was an easy widely distributed imperial ipa with dank proprietary down under hops. 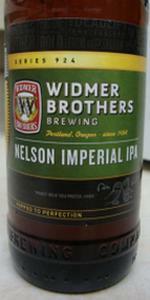 Possibly the best beer Widmer has ever made. L: Pours brilliant amber under a 1” white foam collar that is moderately persistent and clingy. S: Berry, pine, maybe rosemary and tropical fruit aromas. T: this has a real fruity palate dominated by berries and tropical fruit riding on a light caramel malt backbone. The hops are big but exceptionally well done with the hop and malt flavors balancing the hop bitterness. F: Medium body and carbonation. O: This is an exceptional beer that might very well appeal to wine drinkers. More balanced than the hop bombs I've been chasing recently. Not so bitter.